Surfaces suitable for use with Cold Wax Painting Medium, mdf, birch ply, canvas and paper. There's debate about the type of surface when using Cold Wax Painting Medium. Its said that the work must always be on a rigid surface; some say not. Reading the works of the late 18 early 1900's on the subject of wax and oil paint techniques, also, from the research and experiments I have done, nothing suggests or indicates that works using wax medium and oil paint need restricting to a rigid surface. One thing has become apparent however, the modern acrylic primed canvas, with its plastic feel, little absorbency and a 'thin' weave, are an unsuitable surface for a wax/oil painting to live a good life! Perhaps another reason for recommending a rigid surface? Choose a particular surface according to your working methods or the effect required. Birch Plywood is a rigid support excellent for painting onto, it needs no priming for the wax/oil mixture to live well. The plywood veneer can be used raw, primed, or a thin skim of wax applied to the surface, another way of priming. Birch is a stable, quality ground for use with wax medium and oil paint, especially, if numerous layers will be built-up for the work. Unlikely to warp, it will remain sound and carry the weight of paint, however, 3mm would be a minimum thickness. Testing papers that are recommended to be used for painting with oil paint, most paper surfaces worked very well and without 'bleed through'. Watercolour paper also works, especially if given a coat of primer. 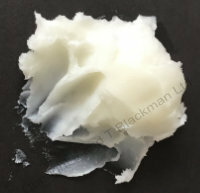 The paper needs to be thick enough and capable of taking the weight of the wax/oil mixture. Painting with wax and oil on paper can be a rewarding experience, it is responsive and the wax/oil live well on it. 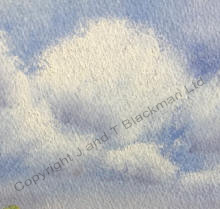 There are concerns about the deterioration of the paper when oil paint is applied, however, a rag paper that is 'buffered' internally and sized externally is highly suitable. Works of oil on paper have lived well, if Constable's oils on paper are an example, some now over 200 years old in the V & A. 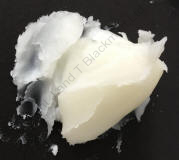 Read a review on Jackson's art-blog about the Arches Oil paper and solvent. Thick stippled wax/oil on paper. Clay, Gesso and Encaustic boards are common in the USA and often used by painters of Cold Wax, because, their surface is designed for wax, both hot or cold! 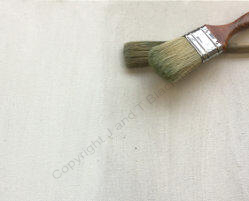 You can find Linen, Canvas and Clay boards in the UK (Jackson's, TNLawrence, CassArt ArtDiscount) or you can make your own primed with a suitable Gesso. Making your own painting surface. Fabric, like the canvas and linen shown right, make excellent painting grounds, either mounted on birch ply/mdf/board or on stretcher bars. 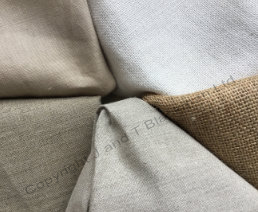 Hessian and Cotton fabrics can be found online, the Linens are from Russell and Chapple. Their shop has a vast array of different types and weights, including, 'off-cuts' which are useful for trying different surfaces. Ready-made canvas can cause problems for Cold Wax and Oil Painting. The acrylic primer used on their weave gives such a 'plastic' surface, consequently, the oil/wax cannot live a good life because it's not absorbent enough!